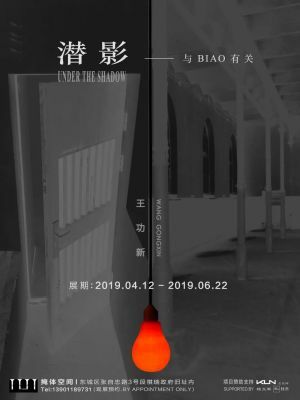 The Bunker is pleased to announce a special project by Wang Gongxin, Under the Shadow – About BIAO, opening on Friday, 12 April 2019, and showing until 22 June. Taking The Bunker’s historical context as a starting point, Wang Gongxin is using sound, light, and movement to create the environment akin to a photography darkroom, in order to explore the complex and sometimes problematic symbolic conne, ctions that bring together the past and present. In this new exhibition project, Under the Shadow – About BIAO is a continuation of the artist's experiences during the 1990s while living and working abroad: in July 1995, Wang created a project titled BIAO at Halle 10, Ludwigsburg. Both Halle 10 and The Bunker have wartime historical roots from the same era but with different cultural contexts and historical memories. Wang is using The Bunker’s unique historical site to reconstruct a project that originated in a different context, in order to highlight the overlapping situations that connect history and contemporary reality. The installation for Under the Shadow, moreover, is an attempt by the artist to bring the audience into his experience of contemporary life, and to reflect on the relationship between the personal and larger narratives beyond our control.